capnnerefir wrote: I've often seen the one in Lujiang called Huan instead of Wan; it seems to be about an even split. Does anyone know the reason for this pronunciation? I just grabbed the character in question (皖), and it appears to be an alternate spelling of the character. Is either of them more correct? Or is it like the Zong/Cong thing, where your guess is as good as mine? There is a hint for understanding chinese place name. Yang阳 pronounced “young” means the sun or sunlight which indicates that the places locate in the south side of a mountain and/or the north of a river. LuoYang locates the north of Luo river.HengYang is in the south of Heng Mountain. Yin阴 is the opposite against Yang , shadow or moon or the moonlight,means south of river or/and north of mountain.such as JiangYin,HuaYin..
My map you can find on http://www.history-in-maps.com/. Map is finished with place names up to Chapter 80 and will be updated. Enjoy, and proposals are welcome. Do any of you perhaps know the source of this map? Also is it reliable? While translating the warlords names (my translation can be seen here) I found one small error: Liu Zhang succeeded his father in 194, yet he is shown as being Yi governor in 189. That map really opens my eyes to the territory difference between the three kingdoms. 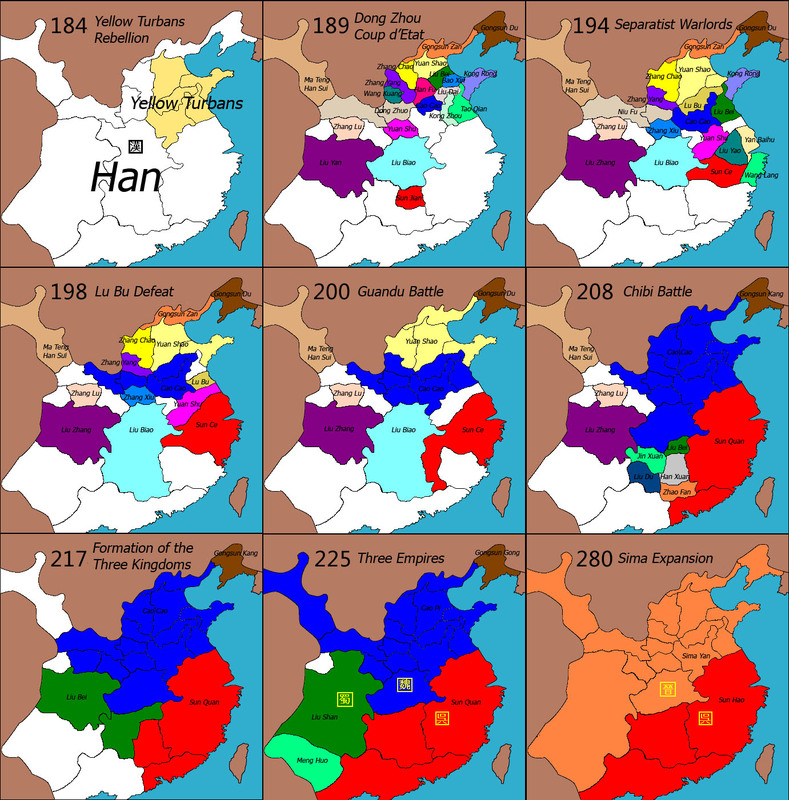 Liu Bei had very little land, so his population must've been extremely tiny compared to Cao.